The American Grown Field to Vase Dinner Tour tends to make news in the communities where it stops. 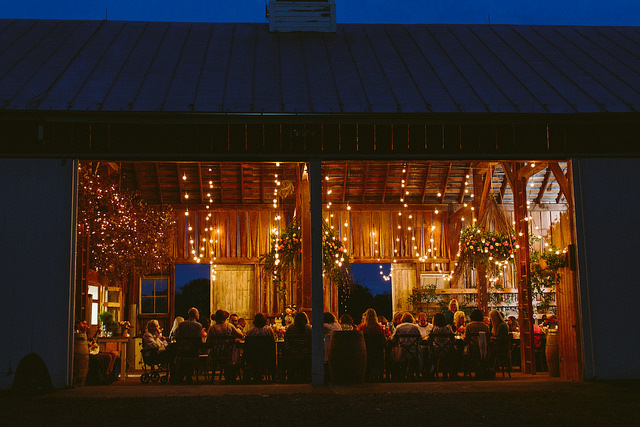 But at a recent stop at Hope Flower Farm in Waterford, Virginia, the dinner was the site of a very special announcement from longtime tour sponsor Syndicate Sales. 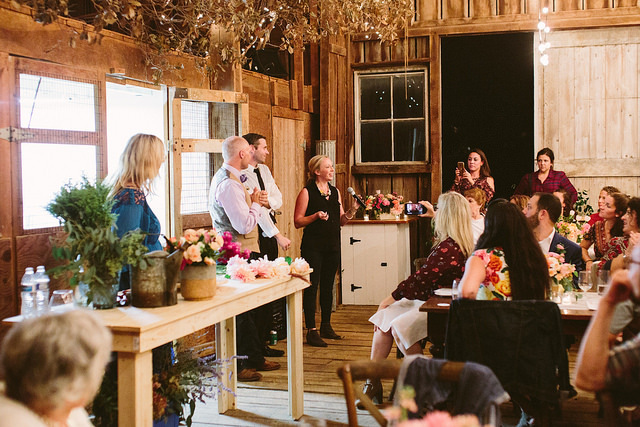 Guests of our recent Field to Vase Dinner in Waterford, Virginia, enjoyed both the beauty of Hope Flower Farm and the stunning designs created by Holly Chapple. Photo: Taken by Sarah Photography. The firm announced the “Holly Heider Chapple Exclusively for Syndicate” line of containers and mechanics to be released in January 2018. Of course, there was nowhere better to launch the line than right there on Chapple’s farm! 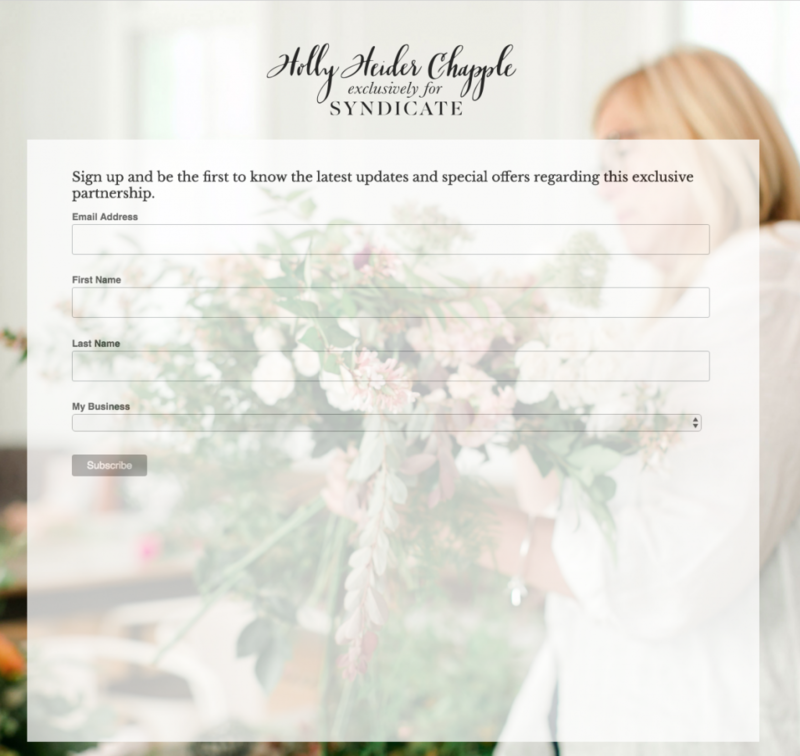 Anne Graves of Syndicate Sales made the exciting announcement of their partnership with Holly Chapple during the dinner. Photo: Taken by Sarah Photography. Syndicate Sales Public Relations Manager Anne Graves says the company partnered with Chapple to design a line of containers that’s fluid and romantic, much like Chapple’s decadent design style. The products will help designers achieve Chapple’s sprawling, airy look. The new product line also includes the mechanics needed to achieve the Holly-like aesthetic. The containers, available in clear glass and opaque black and white durable plastic, feature a footed compote design. 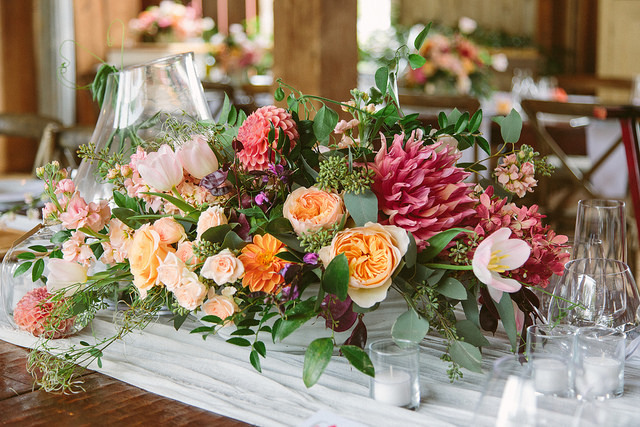 One of Holly Chapple’s gorgeous designs that captivated guests at our Field to Vase Dinner at Hope Flower Farm. Photo: Taken by Sarah Photography. The upscale glass containers are perfect for “show-stopper” arrangements. The plastic compotes are made of light but durable plastic and are great for transporting Chapple’s unmistakable floral design look to venues. The mechanics are what Chapple refers to as a “pillow and an egg” ­– grid-like tools to hold flowers in place in containers. These spectacular mechanics eliminate the hassles of fussing with chicken wire and other materials to create loose horizontal bouquets. The “egg” concept lets designers insert flower stems from all angles while keeping them in place during the design process. The “pillow” follows the same principle, resting on the top of the vase rim and ensuring stems stay in one place and remain hydrated without getting crushed. Because the mechanic rests on top of the container, stems can be inserted around the rim, appearing to spill gracefully over the vase’s edge. All products in the line are reusable and 100 percent recyclable. Graves said the recent American Grown Field to Vase Dinner was the ultimate place to launch the line – after all, Syndicate is a quintessential family-owned American company based in Indiana. Naturally, Certified American Grown is extremely grateful for Syndicate’s ongoing support! For details on the new container and mechanics collection and to sign up for exclusive updates regarding the January 2018 release, check out holly.syndicatesales.com.